Heathrow has posted its 17th consecutive record month, with 6.5 million passengers in March including its busiest departures day ever, with over 136,000 departing passengers travelling on the 30th of March, 2018. Long-haul, emerging destinations were some of the best performers, as the airport reported double-digit growth in African (12%) and Middle Eastern markets (11%). Latin America also experienced significant growth, up 7.3%. Cargo volumes increased by 1.5%, with the airport reporting the 20th consecutive record month. During the course of the month, over 150,000 tonnes of cargo travelled through the UK’s biggest port. The USA (1,659t) and Japan (682t) were among the fastest growing markets for cargo. March was also an award-winning month, as Heathrow’s Terminal 2 beat international counterparts to win ‘World’s Best Airport Terminal’ for the first time in the 2018 Skytrax World Airport Awards. 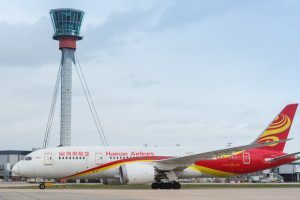 New routes launched by Hainan Airlines and Tianjin Airlines provided the UK’s first direct connections to the growing cities of Changsha and X’ian. Qantas also began its first direct service to Perth from Heathrow – offering the fastest route to Australia for both UK cargo and passengers. This entry was posted in Heathrow. Bookmark the permalink.